How To Apply Foundation and Concealer And What Needs To Be Applied first? Concealer and foundation are the two main makeup products which are essential to give an even texture to your skin. Much like the eternal mystery of what came first the chicken or the egg, a classic makeup debate that never seems to settle is what to apply first the concealer or the foundation. There aren't any set rules on how you should apply your makeup. So, some people apply foundation before concealer and the others apply it after concealing. 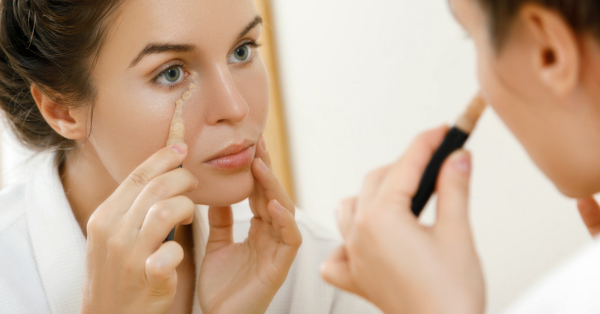 A concealer is used to disguise skin imperfections such as blemishes, dark circles, pimples and expression lines. It helps to give a smooth appearance to the skin. It is applied only on the affected area. Foundation is a cream like formula which has a thin consistency as compared to a foundation. It is used to provide an even skin tone to the skin and sometimes to even change the skin tone. Some of the foundations also do the work of a moisturizer, sunscreen, or simply a base layer for more complex cosmetics. However, What Comes First Foundation Or Concealer? We asked a makeup artist about her approach and here's what we concluded: There's no set rule, it needs to be approached on a case-to-case basis! Meghna Butani, celebrity hair and makeup artist says, "I usually start with concealer, complete the full face makeup and then come back and conceal the under eyes and then powder everything to set it in place! The goal is to achieve even-toned skin so how you do it doesn't really matter." So how to apply foundation and concealer and in which order? Everybody's skin is different and what may work for one person may not necessarily work for another. 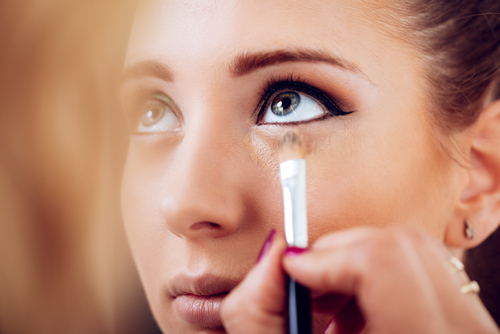 If you have intense dark circles you may need to go in with a colour corrector before you begin your foundation. In this case, the right order would be colour corrector - foundation - concealer. Follow the same process for acne prone skin and blemishes. If you conceal blemishes before applying your foundation, the concealer will invariably move around when you start blending in your foundation. Note: If you don't want to use a colour corrector, the ideal way to go about concealing would be to apply your foundation first and then go in with a concealer on spots and blemishes. If you are blessed with a clear skin and don't have any undesirable spots to cover then you should ideally use a foundation first. If you apply foundation after applying concealer then you will end up removing most of the concealer. So the ideal way for a clear skin is to first use a foundation followed by a little concealer. Choosing a shade that is way lighter than your original skin tone will make you look pale and washed out. The worst part is it will ruin all your arduous efforts to get a natural and flawless skin. The intent should be to look natural rather than too radiant! Doesn’t matter how much late you are getting, if you want to look good you will have to give it some time. After applying the foundation wait for 3-4 minutes so that it blends well with your skin. Later on you can apply concealer on it. Although it comes natural to all of us to cover dark circles by making an arc under the eyes, it doesn’t give a natural finish to the skin. Avoid this and apply three small dots instead which should be blended with upward movements. Instead of applying foundation on the back of your hand to match the correct shade, test the color on your face to select an appropriate match. Try it on your jawline, underneath eyes or around the nose. Hope you know now what goes first foundation or concealer!